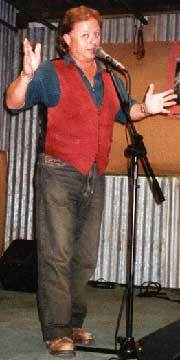 Popular versifier Graeme Johnson has just released his new CD of 'Aussie' Bush Poetry on Pat Drummond’s Shoestring Records label. 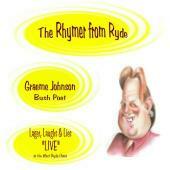 The Rhymer from Ryde’s second CD is presented 'live', a forum that best suits the Bush Poet’s art. It contains 15 tracks with a strong emphasis on humour and combines poetry, yarnspinning and joke telling in the true traditional style of the masters. The CD contains no less than 7 award winning pieces including 'Faces on the Wall' (a stirring presentation of the Anzac legend) which won the Banjo Paterson Bush Poetry Competition in 2004 and 'Calamari Capers' which won the Leonard Teale Spoken Word Award 2005. Other tracks include 'Only a Freesia for Henry' (a poem about the life of Henry Lawson) and a moving rendition of grief on his father’s death 'Have you seen my Dad?'. Comedy is well represented with the original tracks 'Oops' (about the perils of golfing), '50/50' (the foibles of old age), the 'Blonde' poems (a series on the stunner who lives next door), and 'Calamari Capers' (funny things that happen in the pub). $25 (plus p&h) - available through Shoestring Records on (02) 4788 1157 or Graeme on (0419) 415 137. Have you recorded a CD or DVD?